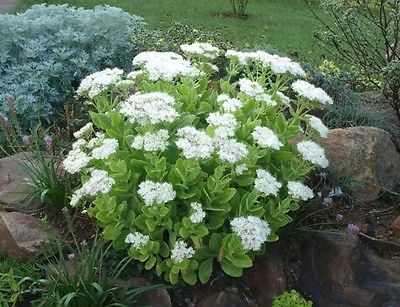 The border varieties of Stonecrop are a dependable choice for the late summer and fall garden, offering foliage interest earlier in the season, then a colourful display of flowers in the fall. This selection begins to produce green broccoli-like buds in mid-summer, which gradually open into large clear-white flower heads, later developing a tinge of pink. Seed heads also have good winter effect. In rich soils, plants may be pinched in June to prevent floppiness. An unusual cut flower, and also attractive to butterflies.